I came to class bearing a sparkly green box in addition to my music and third eye-focused sequence. 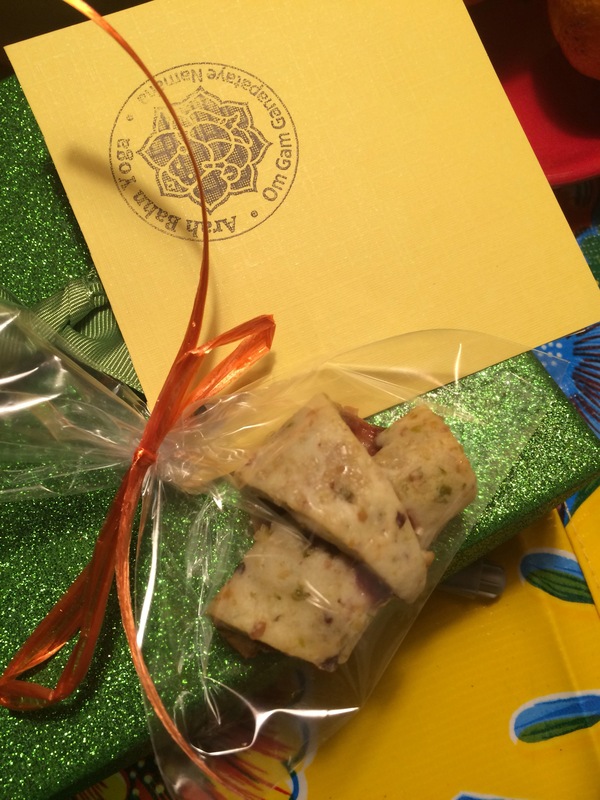 Last year was an exception due to travel, but at the end of each year that I teach yoga classes, I like to prepare gifts for my students. I bring the gifts to my class or classes, or around January 1st. Because I love to bake, there is usually a baked component. However, there’s also some other yoga-related component as well: I try to be sensitive to food allergies or other dietary concerns, while also imparting a little non-asana yoga education. In any case, this is in effort to express my gratitude to students for coming to my classes for as long as they have – be it on that one lucky December or January day, or be it as regular participants in the just-ending year. I feel so lucky to have a terrific bunch of regulars! It’s also a fun opportunity to get creative with some packaging and print design. Earlier in December, I’d found and tested a terrific recipe for rugelach, a cookie I discovered a few years ago on a climbing trip to the Gunks in New York. A local friend had fortified our foodstuffs for the weekend by supplying a huge box of these cinnamon-filled bundles of yum. These are like little cinnamon rolls, though the dough is heavier (my recipe has cheese and no leavening agents) and the filling can be anything you like, I suppose. Cinnamon, chocolate, fruit, nuts, maybe in various combinations of same. In the first batch of my Cherry and Pistachio Rugelach (recipe is here), I experimented with rolling techniques and while the results were tasty, the cookies were mostly too large. Pinterest to the rescue: here are some terrific rugelach prep tips on Bon Appetit, most of which I used, in the second batch – especially the 12 wedges bit (why do Cooking Light editors think that normal people cut pizza into 10 wedges. Who does that? And how?!?). I stuck with the croissant rolling technique as it showed off the dark cherry filling – it brings nice contrast against the green- and red-speckled dough. In past years, for the non-food component I’ve used Ayurveda as an inspiration – pairing a few different treats with various doshas or chakras and allowing students to explore the new vocabulary with their selection. Despite the inexplicable and yet wild (relatively speaking) Internet success of my last installment in this vein (Chocolate, Chakras and the Holidays), I opted for something simpler. 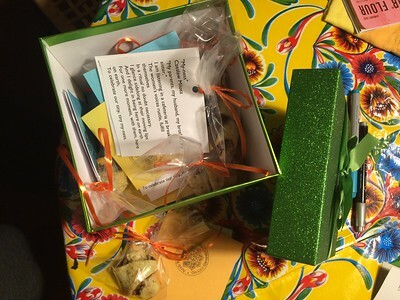 One cookie and one poem, plus some colorful ribbon and a stamp from my new rubber stamp: these would comprise each bundle. I found the poem by spending an hour or so combing through the Poetry app and also through my collection of poetry books. Finally, in a collection of poems about love that was given to me as an engagement gift, I found the one pictured above. I had started my search by looking for something themed along the lines of gratitude, friendship, aging, change: typical topics for year-end summations or hopes for the coming year. By the time I’d gotten to the love anthology, I’d let go of my search terms. 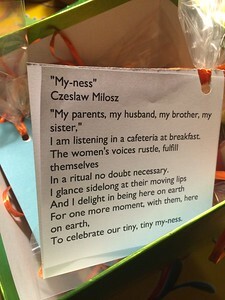 These Milosz words felt right, for sharing with the people with whom I share my yoga practice, each week. I had exactly 12, and 9 people came to the class! Whew. The poem also fit very nicely into our themed sequences, of late. Once again, at the end of the year I was wrapping up a series of practices inspired by the 7 chakras/energy centers in the subtle body. We had arrived at Ajna again, when I was ready to deliver gifts. The practice included extra balancing work as well as some forehead-touching-the ground poses: this energy center governs the health of everything from your chin up to the top of your head: sinuses, vision, brain, and so forth. As such (along the brain theme), this “third-eye” chakra also handles clear vision and understanding: the ability to see things as they truly are, without the filters of ego, misunderstanding and illusion. In my view, the poem is about being charmed by an awareness of each other as individuals, but also about the comfort that we can find in what we all seem to have in common. There is yet another dimension in which this (or any) poem fit into my yoga practice, and the practice I later share with my students: I’ve been reading about and exploring the yoga of sound and music. I’ve been digging into it because I struggle with most music that includes some sanskrit words. Unless it’s got a catchy rhythm (to wit: the Healing Drum tune I discovered) or its translated words appeal to me for whatever reason (elephants! blessing new endeavors! Why not? We all need help! ), I find that listening to and singing these songs … agitates me. So, when I first read it earlier this year, I made some inroads, and I’ve since been rereading The Yoga of Sound. It breaks yoga sound into several groups, and within one –the vedic or “shabda yoga”– group, we learn that the act of putting together words to express a real feeling is a very special act, if not one that is so special that it connects the writer – and the person later reciting it aloud – to the “divine”. This is even if the reader doesn’t understand the words, literally (because they are in a different language) or intelligently (their meaning is lost among esoteric imagery or even just bad writing). From this I infer that all creative writing is a super special thing. Perhaps this inference is in error? But gosh, good poetry is such a rush of an experience for me. Hence the BA in English with a thesis on Robert Burns. So: if I find a poem that speaks to me, and I share it with other people. Usually, they appreciate it and let me know. Such has been the case, with this gift for my yoga students, this week. Three of them so far have indicated their pleasure in the poem.